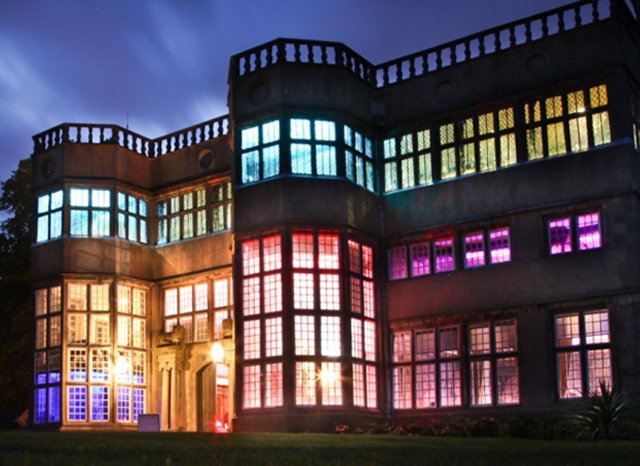 ​“Astley Hall is the most exhilarating house in Lancashire” - Simon Jenkins in his book ‘England’s 1000 Best Houses’. The site was acquired in the 15th century by the Charnock family from the Knights of St. John of Jerusalem. The Charnocks built the original timber-framed house, around a small courtyard, about 1575-1600. In 1665, Margaret Charnock married Richard Brooke of Mere in Cheshire (son of Sir Peter Brooke), and they built the present grand but asymmetrical front range of brick with a pair of vast mullion and transomed bay windows. This front has a doorway with distinctly rustic Ionic columns, remarkable at such a late date. 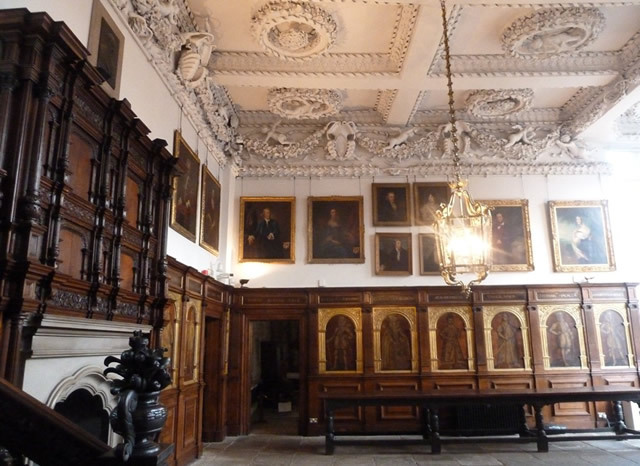 The interior is notable for the staggering mid-17th century plasterwork in the ceilings of the Great Hall and drawing room, which have heavy wreaths and disporting cherubs. The ceilings are barbaric in their excesses, and the figures are relatively poorly modelled, although the undercutting is breathtaking. Not all the moulding is of stucco: there are elements of lead and leather too. The staircase is of the same period with a coarse but vigorously carved acanthus scroll balustrade and square newels with vases of flowers on top. The lower parts of the hall are panelled with inset paintings of a curious selection of modern worthies, including Protestants such as Elizabeth I and William the Silent; Catholics such as Philip II and Ambrogio Spinola; the explorers Christopher Columbus and Ferdinand Magellan, and Muhammadans such as Bajazet and Mohammed II, Sultans of Turkey; it is thought this scheme might be rather earlier than the other work and date from the time of MP Thomas Charnock, who died in 1648. The entire width of the house on the top floor is occupied by a long gallery which contains the finest shovelboard table in existence, 23.5 feet (7.2 m) long. The house contains a bird's-eye view by an unknown artist showing the house c. 1710, which depicts small tower-gazebos at the angles of its forecourt. In due course, the Brookes failed in the male line and the house descended to Robert Townley Parker of Cuerden, who added the south wing in 1825 and stuccoed the exterior, probably to the design of Lewis Wyatt, who worked for Parker at Cuerden Hall. The dining room in the early 19th-century wing has inlaid 16th-century panelling brought in from elsewhere. In 1922 the house and its contents were given to Chorley Corporation by Reginald Tatton, as a memorial to the local men killed in World War I. It has since been maintained as a museum. The house contains fine oak furniture, Flemish tapestries and wooden panelling. It is rumoured that Oliver Cromwell stayed at the Hall during the Battle of Preston in the 17th century and reportedly left his boots behind. The grounds with a small lake were landscaped by John Webb and feature a picturesque meandering stream running through a wooded ravine. The Park, Coach House and Walled Garden have recently been renovated. An extensive project has seen the restoration of the 17th century ha-ha, de-silting of the lake, felling of trees, moving pets corner and extensive renovation of the coach house and walled garden. The Coach House now houses a new art gallery and conference room on the first floor, with a cafe and education space on the ground floor. Due to the historic nature of the Hall only the ground floor is accessible to people with wheelchairs. Although there is a DVD available to watch to give you a video tour of the upper floor rooms. The Coach House is entirely wheelchair accessible and includes a lift in order to provide access to the first floor. The rest of the park is largely accessible as an open space although paths within the woodland can be unsuitable for wheelchair users and it is advised that care is taken in these areas. Location : Chorley, Lancashire PR7 1XA. Transport: Chorley (National Rail) 20 min. walk or bus. Chorley is served by regular buses from surrounding towns, including, Blackburn, Bolton, Manchester and Preston. From the town's bus station C8/9 minibuses operate every 15 minutes to Astley village (except Sundays).